Are you a Sherlock Holmes at heart? Do you love Cluedo? 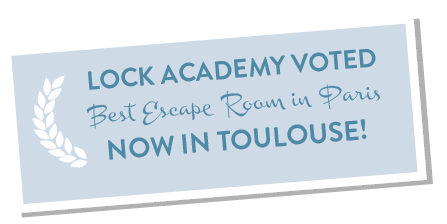 Solve the unique mysteries of the Lock Academy Live Escape Game in Toulouse. We accept players from 9 years of age accompanied by two adults, or from 15 years alone. Young children and babies cannot participate. Our 2 award-winning original mysteries will test your teamwork at Team Building days, birthdays or with your family and friends. Are you ready to solve the mystery? Solve the mystery in the student bedroom of Professor Lock’s own missing daughter. An Escape Game full of surprises! As though in a giant game of Cluedo, search the office of the Dean of the Academy in order to find the murder weapon, the motive and the culprit. 90 Minutes to lead this investigation in the street of the Pink Ciry ! A life-size treasure hunt that will surely come out of your detective instincts! A new escape room is on the way!